It refers to the changes made to the patient’s lower jaw in order to make it more v-shaped and make the over face smaller. Since lower jaw can be divided into 2 parts, square jaw and chin, usually angleplasty (square jaw reduction) and geonioplasty (chin surgery) happens to be performed together in order to achieve v-line face. The procedure begins with making a clear cut of square jaw and removing the bone. With the horizontal removal, the lower jaw/chin bone is removed vertically in three areas. The mid chin bone that causes the flat and wide appearance is removed. The remaining chin bone is then pushed inwards and fixed to result in a slimmer chin. Who are the candidates for V-Line surgery? - Those who already had the square jaw surgery but V-line was not achieved. - Those whose chin is longer than average or is asymmetrical. - Those whose square jaw is the first noticeable feature of the face. - Those whose side view is more angled. Natural V-line can be created after surgery because the exact angulated bone is resected. The amount of bone resection is minimum, it occurs the fast recovery. It gives the noticeable effect from the profile view but less effective from the front view. This surgical procedure trims the entire chin into smooth and long curvature from the mandibular angle below the ears to the tip of the chin. It can create slim tip of the chin whereas establishing gentle curvature for the entire chin line. This procedure is appropriate to effectively create smooth chin line as long as the tip of the chin is not too wide. Human bones consist of three layers: outer cortical bone, cancellous bone, and inner cortical bone. Generally, cortical bones refer to the hardest bone structure, the so-called outer cortical bones. 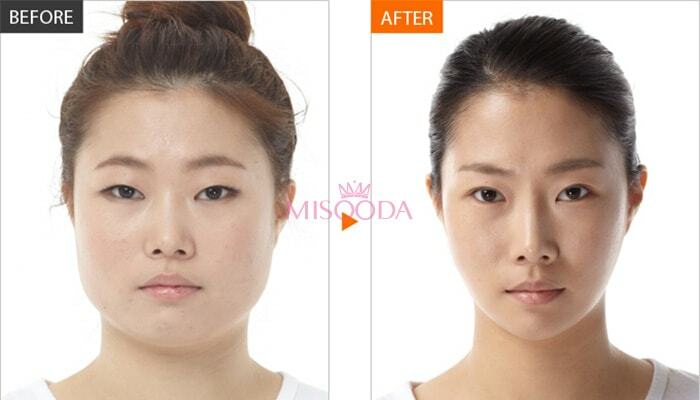 By only cutting the outer cortical bone layer, we can create a beautiful face shape. As you would peel a thick banana skin, we cut the outer cortical bone to create a slim jawline. The surgery creates a sharp V shaped chin whilst removing the angular jaw by adding chin width reduction surgery to the existing Square Jaw Surgery (‘U line Square Jaw Surgery). If the jaw and the chin are wide, a slim V-line jaw/chin line can be achieved by fracturing the chin bone in a T-shape and gathered to the center. Commonly, a face is considered long when the length of the face or the chin is longer than average being out of harmony and balance with the face. After measuring the length of the chin, a slim V-line jaw/ chin line can be achieved by fracturing the chin bone in a T-shape and gathered to the center. Weak chin refers to when the lower area of the face is small and appears weak or due to the under development of the chin, the chin is receded and short. It is a method repositioning the chin bone forward after fracturing the chin bone which was originally receded. This method repositions the chin bone forward after fracturing the chin bone which was originally receded. The length of the chin can be adjusted depending on the angle of the bone fracture. The result is natural. “Asymmetrical Face” refers to when the facial bone of the overall face including the lower face; between nasal tip and chin tip, is asymmetrical caused by various reasons such as unusual development of the bone. General price guide line for V-Line Surgery in Korea is USD$5,500 to USD$7,000 according to Korea Health Industry Development Institute. The price is decided in variable range depending on the method and difficulty of patients’ case.